Uda City in Nara Prefecture is located right in the midst of Japan’s beautiful mountains and forests. Since I come from a small town in Alabama, Uda had a familiar feeling. However, like every other place in Japan, there was unfamiliar feelings as well! To say that the scenery around Uda was beautiful doesn’t begin to do it justice! It was amazing! Since Uda is located in such a rural area, there was a lot less English than there was in Omura. Therefore, many of us were not quite sure what adventures our Host Family Day would hold. The answer was simple: Ninjas. About an hour away from Uda is Ueno City, which has Ueno Castle…. And a Ninja Village. It wasn’t only me and my host family that went. Eve and her host father, Frank and his host mother and host nephew, and Shao and Tanja and their host mother all joined us. At Ueno’s Ninja Village you can learn about real ninjas, how they lived, their equipment, and special features of their house! 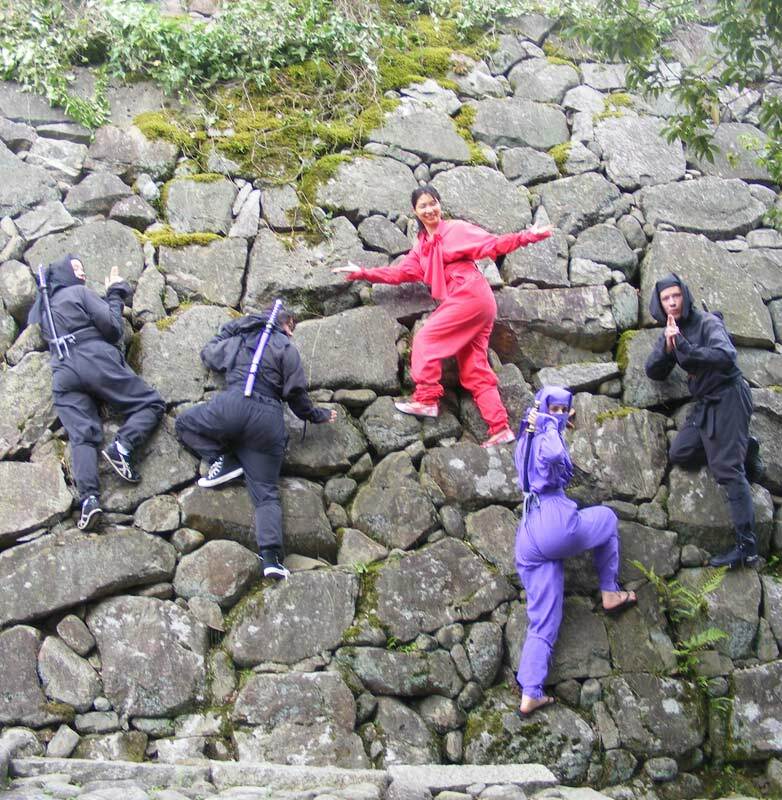 Also, for 500 Yen, you can dress up like a ninja all day long! Although this sounds like tons of fun, I had heard from someone else that it was not as fun as it might seem. Therefore, I was a little hesitant. However, this day was the highlight of my trip to Uda. For a short time, we 5 foreigners were an elite ninja assassin clan! As ninjas we ate udon, explored Ueno Castle, threw shuriken, and took pictures with some tiny ninjas! The rest of the day was spent stealthily moving from tree to tree, finding the most ninja-esque poses possible, and doing things that would just look better if it were done by ninjas! I have to say this might have been the best Host Family Day Ever!